We are Happy Marketer – we love digital marketing – and we’ve got awesome teams in Singapore, Bangalore and Kolkata. Our founding partners have over a decade of Website & Search Marketing experience and our clients include some of the biggest names in Singapore like Starhub, Singtel, Phillip Capital, to name a few. And we get to work on really exciting digital marketing projects involving Search Engine Optimization, Search Advertising, Social Media and Web Analytics. We’re looking for entrepreneurial minded techies to join our new team in Bangalore. You would be working on executing projects for our clients. Know someone who might be just right for the role? 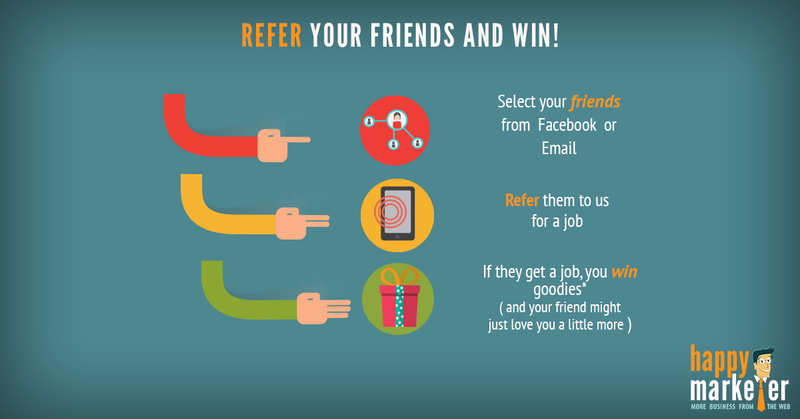 Hit the ‘Refer A Friend’ button and win awesome goodies. Know more. The Personal Assistant to CEO role is a role that requires one to be very meticulous, organized and has good task management. You would need to be a strong self-learner that is willing to pick up the necessary skills on the go. Undertake special assignment, ad-hoc projects, functions and related duties as and when required. Looking for an experienced and knowledgeable SEO (Search Engine Optimization) Consultant to join our office in Singapore. The SEO Consultant will be responsible to action SEO strategy across a number of websites, hence needs to be goal oriented, possess exceptional attention to detail, and have outstanding interpersonal skills. Ideal candidate will need to demonstrate passion for SEO, organisation skills and great attention to detail. The ability to multitask, manage multiple accounts and prioritise tasks based on performance is also essential. Developing and implementing effective search engine optimization (SEO) strategies for this improvement of organic search ranking and the maximization of ROI. Experience in Multi Project Planning and management to create and support SEO marketing plans and communicate timelines, process updates, roadblocks etc. on regular basis to the team. Ability to interact with people at all levels of an organization, strong cross-functional teamwork in a fast paced, high growth environment managing offsite and onsite optimization projects and reporting on performance. Ability to manage a team and guide resources in project planning, tasks execution & responsible for overseeing all SEO campaign activities conducted by the team. Support the senior/head of SEO to execute an SEO strategy and update on the project planning to ensure smooth workflow. Well versed in preparing SEO reports on a weekly and monthly basis to be shared with client and identifying areas for improvement. Showcase a deep understanding of how content and link building works to optimize websites along with strategies for asset optimisation, for consumers and search engines. Work cross functionally with our content team (agency and in house) to ensure content strategy is fully SEO optimised and back links are clean and valuable. Understanding of content marketing tactics, such as SEO, PR and social media marketing. We are looking for hard-working, smart, digital savvy graduates to work with our SEO team in Singapore. If you are looking to work on exciting projects with some of the largest brands in South-East Asia , this is a great way to get started. Work with the tech team and copywriter to ensure SEO best practices are properly implemented. We’re looking for a right-brained creative genius who has the knack for smart ideas and even smarter execution. You are somebody who not only can think of compelling ideas but also possess the content and design sensibilities to create and launch campaigns single-handedly. As this role is part of the social team, we are looking for someone brilliant at articulation and conceptualisation in near-real time. Buzz generation – developing high impact one off activities that get people talking about your brand/product. Lead and participate in strategy and design discussions to create the most compelling campaigns for our clients. Supervise and inspire the creative team to generate multiple concepts for a campaign or project. Embrace new and innovative ways to tell stories on the web. Graduate in Mass Communication, Literature, Media. A national/world news junkie with an interest and understanding of politics, business, tech, sports, and global affairs. Deep understanding of social media platforms (Facebook, Twitter, YouTube, Google+, Pinterest, etc. ), have the ability to translate ideas into design and writing. Able to multitask while still paying attention to detail. Well-rounded knowledge in photo and video editing software. If you are looking for designer or copywriter role. People not familiar with the digital medium. People who expect this to be a 9 to 5 office job. Proven social presence on multiple platforms. Digital Transformation is the Consulting arm of Happy Marketer focussed on co-creating transformation journeys for organizations by designing people, process and technology improvements. The team works as a separate business unit in Happy Marketer with a strong growth mandate in Singapore and South-East Asia. The ideal candidate should be able to thrive and find inspiration in dynamic, unstructured work environments and be able to distill key project requirements through strong stakeholder relationship building. The role requires an individual with a strong combination of strategic thinking and detailed tactical planning. This role is also open for part-timers based in Singapore. We are looking for a Lead Consultant, CRM & Marketing Automation, an expert in Marketing Automation to manage & creatively direct a team that executes all search CRM and lifecycle marketing projects. He/She would be responsible for planning, implementing & monitoring all marketing automation related activities across all the platforms like HubSpot, Eloqua, Mailchimp, Intercom, Marketo, Responsys etc. This person will be leading a team of 3 to 5 consultants and manage the ROI. The marketing automation team works as a separate business unit in Happy Marketer, and the person should have the capability to run this division as a successful unit. This involves a lot of decision-making, risk taking appetite, foresee the future of marketing automation and proactively plan for the same. Motivating the team, steering away unwanted pressures, keeping the team focused on a day to day as well as weekly basis are some of the routines for this Lead Consultant. Managing the Business: We run this team as separate a business unit with its target margins and profits in each quarter. The Lead Consultant’s role is to drive these numbers, plan for the accounts regarding manpower, account strategy, and meeting client expectations. The critical thing here is to foresee the red-flags hindering this growth and proactively tackling it. Future of CRM, Marketing Automation, Lifecycle & Loyalty Marketing: This person has to have an eye set for the future and prepare his team to be future ready. This can be training, building core strength or learning new skills. The person should have the flair to experiment with new platforms, create their own frameworks, reporting metrics and so on. Productivity and Quality: We are a small but highly efficient team who delivers quality work. There will be times where the Lead Consultant has to roll up the sleeves and get things done. You should have the hands-on experience required to lead the pack and inspire them to deliver quality work. New Business Opportunities: This person will also be part of new pitches. This kind of work requires ideation, auditing and proposal planning skills from the person. Only extensive knowledge in the domain will help to come up with a good strategy. The person should also be promoting the wins and achievements of his team and be responsible for churning out case studies for the division. At-least 4-6 years of Marketing Automation experience across HubSpot, Eloqua and other platforms is a must. Solid understanding of CRMs, customer journeys, email marketing best practices, loyalty platforms and automation platforms. We need a superstar to support our superhero team through the different administrative tasks. We’re looking for a Google cloud consultant with 3-5 years of relevant work experience for our Singapore office. We work with some of the most fascinating and known brands in the APAC region from the sectors including banks, ecommerce players, apps, airlines, hotels and other large B2C companies. The ability to work with loosely defined requirements and exercise your analytical skills to clarify questions, share your approach and build/test elegant solutions in weekly sprint/release cycles. Design and implement key components for highly scalable, distributed data collection and analysis system built for handling petabytes of data in the cloud. We’re looking for a Data Analyst with 1-2 years of relevant work experience for our Singapore office. We work with some of the most fascinating and well-known brands in the APAC region from the sectors including airlines, hotels, publishers, ride sharing apps, telcos, and other large B2C companies. Analyze data and generate insights in form of revenue/growth prediction, trends and anomalies, customer segmentation, DAU/MAU reports, conversion optimization, monthly reports, etc. Looking for an experienced and knowledgeable SEO (Search Engine Optimization) Consultant to join our office in Mumbai. The SEO Consultant will be responsible to action SEO strategy across a number of websites, hence needs to be goal oriented, possess exceptional attention to detail, and have outstanding interpersonal skills. As an SEO Consultant, you will be responsible for managing all operations for assigned set of website(s). Qualified candidate should be able to execute on various SEO tasks along with Off-Page strategies (preferably Social Media). Ideal candidate should be able to demonstrate the ability to work in a team of highly collaborative environment and execute skills in various SEO tool such as Google Analytics, Adwords, Search Console & be able to learn new SEO tools as required. Optimise various web site components including TITLE, descriptions, internal linking, sitemap submissions, etc. Executing tasks in SEO that will help in achieving higher rankings in major search engines and in maximizing traffic to the website. Ability to manage building a stronger online presence, by managing natural search tasks such as On-Page optimization, Traditional Link Building tasks such as Directory submission, Articles posting, Blogs and Forums along with other online marketing activities is a plus. Comfortable in using various keyword research tools to find the best possible keywords for optimization. Review and manage back link, execute on new backlinking opportunities to improve link quality. Research and analyze competitor sites. Participate in various social media networking websites including social news, social bookmarking & more to build network & drive traffic to our websites. We are looking for someone who has their finger on the pulse of everything happening in the Performance Marketing space, with an ability to use it for driving innovation and delivering value to clients. As an Associate Consultant, you may be handling multiple accounts at the same time. Your role will be focused on day-to-day delivery while working with the Director of Performance Marketing who manages tasks & priorities. We do expect you to own the deliverables and build an excellent working relationship with your global counterparts. You will also be briefing teams of copywriters and designers on campaigns and ideas, so innovation, attention to detail & accuracy should be your key strengths. Manage paid media channels like AdWords, Bing, Yahoo, FB, LinkedIn, Twitter, etc. 2 to 4 years hands-on experience in various Paid Media Platforms. As a Performance Marketing Intern, you’ll work directly with our Director of Performance Marketing to launch campaigns and implement growth and performance marketing strategies to help our clients with their vision. The candidate will need to have familiarity with Google Sheets and Excel formulas and also has excellent written and verbal communication skills. Throughout the internship you will develop both qualitative and technical marketing skills, including strategic research, data analysis and processing. Digital Transformation is the Consulting arm of Happy Marketer focussed on co-creating transformation journeys for organizations by designing people, process and technology improvements. The team works as a separate business unit in Happy Marketer with a strong growth mandate in Mumbai. Continuously discover and pro-actively implement new mobile analytics solutions to remain prepared for future. We are looking for someone who is passionate about analytics and is able to approach complex problems in an organized and detail-oriented manner. You should be an intellectual athlete who has the desire to learn about customer behavior and the important drivers of various departments. 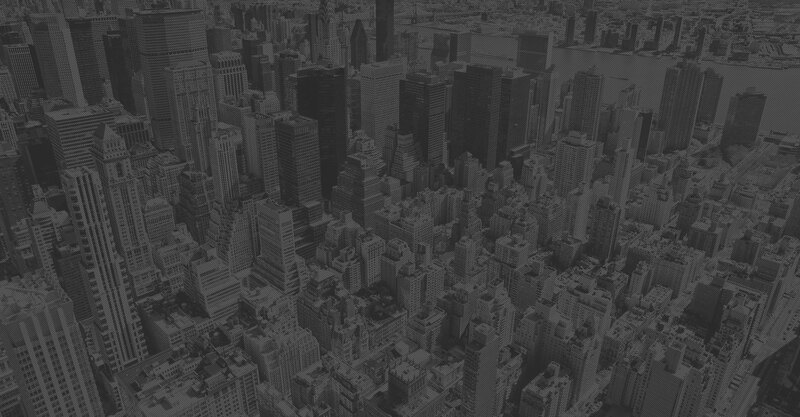 3+ years of experience with tools commonly used for data analysis such as Python (numpy, pandas, and scikit), or R.
Strong experience with at least one scripting language, such as Python, Ruby, Perl, or Bash. Experience with business intelligence tools such as Looker, Tableau, Business Objects, or Microstrategy. Familiarity with MPP databases, such as Redshift, BigQuery, Vertica, etc. We’re looking for an IT professional with 1-4 years of relevant work experience for our Mumbai office. We work with some of the most reputed brands in the APAC region from the sectors including airlines, hotels and other large B2C companies. We are looking for a Project Coordinator with 2-3 years of documentation experience for our office in Mumbai. At Happy Marketer, we work with some of the most prominent and reputed brands in the APAC region from sectors including airlines, telcos, publishers, apps and other large B2C companies. Looking for an experienced and knowledgeable SEO (Search Engine Optimization) Consultant to join our office in Bangalore. The SEO Consultant will be responsible to action SEO strategy across a number of websites, hence needs to be goal oriented, possess exceptional attention to detail, and have outstanding interpersonal skills. Digital Transformation is the Consulting arm of Happy Marketer focussed on co-creating transformation journeys for organizations by designing people, process and technology improvements. The team works as a separate business unit in Happy Marketer with a strong growth mandate in Bangalore.